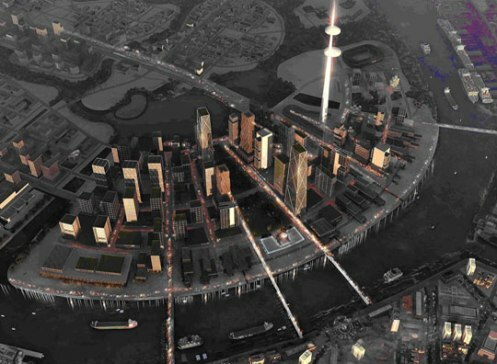 VNRE – On April 26, 2011, Foster & Partner consulting firm presented the preliminary ideas planned of the International Finance District for Thu Thiem New Urban Area. The participants attended including the Thu Thiem ICA, Department of Planning – Architecture, and Department of Transportation. Departments and Thu Thiem ICA highly valued and impressed with the research in which propose new ideas for the plan. The proposals detail that relating to the solution design for space at central zone in order to create attraction, active in order to shape the International Financial Center in Thu Thiem New Urban Area. However, there’re many solutions ideas in the proposal differ from the detailed planning at scale 1/2000 of Thu Thiem New Urban Area that was approved in 2005, and the principles which were defined in the the contents tasks of partial adjustment of detailed planning at scale 1/2000 of Thu Thiem New Urban Area, in which People’s Committee of HCMC has approved and being implemented by Sasaki- the consulting. Therefore, Foster & Partner need to compliance general principles of the master plan and coordinate with Sasaki consulting to ensure the uniformity and harmony. The delegates suggested Foster & Partners need to conduct a deeper research on the scope of the planed area of international financial center, to clarify details about the layout space, details of key functional areas, about the related architectural space and landscape, and the infrastructure condition… Foster and Partners has to analyze and evaluate the feasibility factors and established conditions of International Financial Centre; as well in making a comparison between the history and development conditions of some major financial district in the region and the world such as Hong Kong , Singapore and London. Thu Thiem ICA will continue to coordinate and provide the necessary updates documents for the Foster & Partners consulting as well appropriate suggestion to solutions. Reported by Thuan Thao | Thu Thiem ICA.